Well here we are in the supposed depths of winter in 2008. however here in the sunny south it is 75 today. which always makes me want to get started thinking about spring gardens.... so i just had to get a few seeds atarted yesterday. for a spring crop this year i have moved over to almost all "heirloom seeds" i am trying to grow varieties i have never grown before. These will include "Violetta Italia " Cauliflower, a purple heading cauliflower, (of course when cooked it will turn green) i started some lettuces , romaine, and red deer tongue( butterhead variety) and some onions and Brussels sprouts. the brussels are more of an experiment as it usually warms to quickly here in the southern US to grow them as a spring crop. but hey where is the harm in trying 8 plants to see what happens. the ground is too wet to work over in my garden and I will be taking my soil samples to test the ground soon. This past summer i cover cropped 75% of my garden with Rye and with field pea (forgot the name just now) and that has really added alot of spongy organic material to the soil. onto a different topic. 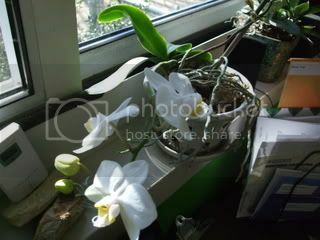 My orchid has bloomed for the second time in a year!!!! bot did i finally find the right place for this to live!!! here are some photos. all the blooms have not opened yet. when they do I will certainly post more photos. lastly i left the old growth stem from the last flowering period on the plant. I had heard or read that occasionally they re-bloom. Well they set 3 more flower buds on that stem. so far they are considerably smaller blooms, but since they aren't opened yet, hard to tell. Thats a beautiful bloom todd. 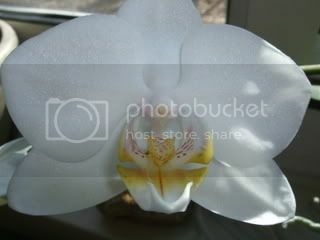 Lovely Phalaenopsis you've got there. I was told to cut the flower stalks back, but I can't cut anything still green so I didn't. Mine rewarded me with flowers on the old stalk and a new stalk, just like yours. 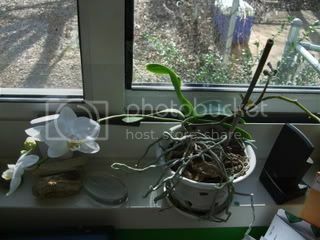 You make cultivating orchids seem so easy. that sure is a beautiful speciment you have there.